Creatine is a naturally occurring dietary compound primarily produced in the liver and stored predominately in muscular tissue; however, it can also be ingested through sustenance or supplementation. Creatine supplementation possesses documented exercise benefits, particularly related to short, high-intensity bouts. Evidence suggests that improvements are possible regardless of age or gender. Positive associations with creatine supplementation include increased strength, lean body mass, and enhanced fatigue resistance.Creatine supplementation plus resistance training translates into a larger increase in bone mineral density, muscle strength, and lean tissue mass than just resistance training alone. It has been shown that higher brain creatine is associated with improved neuropsychological performance. Many athletes utilize creatine for body building or for improving athletic performance, aiding in the worldwide growth in popularity of creatine supplementation. For older adults, the use of creatine can improve their quality of life and may reduce the disease burden on their cognitive dysfunction. Overall, creatine is a safe and cheap supplement that has both central and peripheral effects for adults. Creatine supplements can be taken to function as an ergogenic aid during exercise. Creatine supplementation increases the levels of phosphocreatine (PCr) in muscles, which is used by creatine kinase to regenerate Adenosine triphosphate (ATP) in skeletal muscle. Increased levels of PCr improves exercise performance during high intensity exercise and muscular strength and endurance. Research has evaluated the effects of polyethylene glycol (PEG) creatine supplementation taken for a 28 day period to assess its effects on anaerobic capacity. Creatine binds to PEG, which functions as a delivery system and increases the reuptake efficiency and ergogenic effects during exercise. Supplementation with PEG-creatine resulted in improved performance in vertical power, agility, and upper-body endurance. Some of these improvements could be due to the shortened muscle relaxation time acquired from the creatine supplementation, which would assist quickly repeated muscle movements. The supplementation also caused an increase in body mass. The improvements generated by PEG-creatine supplementation would be most beneficial for untrained individuals. 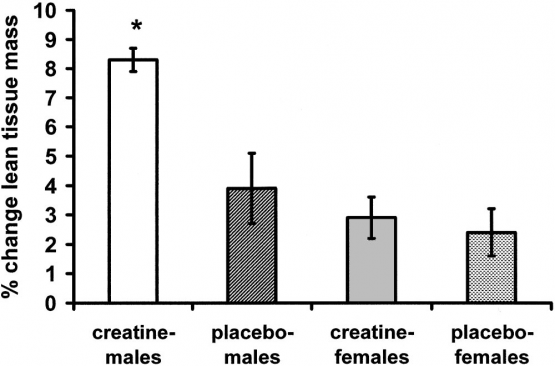 Creatine can also affect post-exercise returns to homeostasis. Creatine supplementation has been found to reduce both blood pressure and heart rate recovery time after exercise. Long term usage of supplements, after 30 days of continual use, has also been shown to reduce exercise induced muscle damage, decreasing recovery time and maximizing performance. Creatine loading has been evaluated for its effects on anaerobic running capacity (ARC) and body weight changes for males and females. ARC represents the theoretical distance an individual could run using only stored anaerobic energy of ATP and PCr. Creatine loading increases available ATP and PCr for creatine kinase reactions. After creatine loading, males experienced a 23% increase in ARC, but females had no significant changes. This could be due to the higher resting levels of intramuscular creatine in females, which would make them less sensitive to creatine loading. Body weight changes were small in both males and females and were mostly from increased intramuscular water volume. Therefore, for sports involving running, creatine supplementation can be used to increase anaerobic running capacity in males without the potential to decrease performance from weight gain. Another study that supports creatine supplementation and improved anaerobic performance focused on young adult males. The participants completed two Wingate Anaerobic tests on the bicycle ergometer with average power and maximum power being measured. The results of the study showed an increase in average power in those who supplemented with 20g of creatine monohydrate per day over a seven day period. Creatine's ability to improve the function of the ATP-PC system may improve muscular strength. One study looked at the effects of varying doses of creatine and frequency of resistance training on muscular strength over a six week period. The participants performed a one-repetition max test (1RM) for upper extremity using a bench press test and one for lower extremity using a leg press test. The results showed no improvement in muscular strength following creatine supplementation. Another study examining young adult males to investigate the effects of seven days of creatine-monohydrate loading on muscular strength. The study used a 1RM bench press and 1RM lower extremity test to measure changes in muscular strength. The results showed no improvement in strength from creatine supplementation. These two studies revealed insignificant results for the short-term benefits of creatine supplementation on muscular strength. In contrast to these studies, two studies found significant increases in muscular strength after 28-30 days of creatine supplementation with creatine monohydrate and PEG creatine supplementation. A 12 week study with older adult women found increases in max strength and muscle mass. In another study, the effects of creatine were studied on muscle power in elite athletes. The results of this study were a little different than in the two mentioned above. The authors of this randomized control trial studied elite soccer players during their seven week pre-season training. They had a creatine supplement group and a placebo group and took measurements on muscle power and jump performance before and after the seven week pre-season. The measurements in the creatine group were slightly better after the seven week period but, interestingly, the placebo group had better results before the pre-season than they did after. This suggests that creatine can work as more of a recovery supplement, helping patients gain progress faster because they are not in the recovery stage as long. This has significant clinical implications on the effects of creatine on highly trained individuals in therapy. Like many other ergogenic aids, studies have shown that creatine supplementation will effect men and women differently. The figure below is a chart that represents the results from a study that compared the effect creatine has on lean tissue mass in both genders. Creatine can be effective in the rehabilitative setting. Creatine supplementation has been shown to prevent the downregulation of GLUT4 transporters, maintained muscle glycogen content, and maintained muscle creatine content during the immobilization phase of recovery. Creatine supplementation also helped increase muscle GLUT4, muscle glycogen, and muscle creatine levels above baseline after three weeks of rehabilitation. Creatine supplementation has also been proven not only to attenuate muscle atrophy during immobiliztion, but to stimulate muscle hypertrophy during rehabilitive strength training. This information is vital to the field of rehabilitation because creatine may help decrease the recovery time of patients, and increase the benefits of recovery. Athletes or individuals who enjoy exercising may not have to face losses in muscle strength during an injury, and their prognosis may be better after rehabilitation if they supplement with creatine during their time being injured. With these positive effects of creatine supplementation, rehabilitation professionals should consider implementing creatine supplementation into their interventions. Another study related to creatine use during rehabilitation is a randomized controlled trial conducted by Fuld, Kilduff, Neder, Pitsiladis, Lean, Ward, & Cotton (2005). In this study, forty one patients with chronic obstructive pulmonary disease (COPD) were divided into two groups. One group was given a creatine supplement, and the other was not. Both groups completed several different tests and went through a pulmonary rehabilitation plan. Throughout the intervention, pulmonary function, body composition, muscular strength, exercise capacity, and quality of life were evaluated. At the end of the experiment, the patients who ingested creatine showed improvements in body composition (increase in fat free mass), muscular strength, and quality of life. The results are significant because they suggest patients struggling with COPD may improve peripheral strength, potentially alleviating mortality factors associated with COPD such as muscular atrophy and dysfunction. Creatine supplementation can be beneficial to patients who have Parkinson’s Disease. These individuals have decreased muscle strength, uncoordinated muscle movements, tremors and rigidity in the limbs, and loss of muscle mass. Several studies have been conducted to understand the effects of creatine on exercise for people who have Parkinson’s disease. The research literature concluded that creatine significantly increased muscle strength, endurance, and improved the ability to exercise in patients with Parkinson’s disease. Creatine supplementation can be useful for patients with Parkinson’s disease by increasing the benefits of resistance training and therapeutic exercises. According to a Cochrane Systematic Review, creatine supplementation is beneficial to those diagnosed with muscular dystrophy. Several RCTs have shown short- to intermediate-term treatment of creatine supplementation can increase a patient's muscular strength by 8.5%. Based on information collected from self-assessments, patient's taking creatine have increased functional performance of their ADLs. Of those participating in the studies, 44% of the patients felt better while taking creatine due to their ability to function at a higher level. These patients often participate in aerobic exercise while in the clinic, but building muscle strength can help their overall daily routines. Long-term supplementation has yet to be evaluated. The effective use of creatine as an ergogenic aid is well documented in research literature. However, there is less research available on its use in the elderly population. Exercise programs coupled with creatine supplementation results in increased strength and fat-free mass in both men and women aged over 65 years when compared with exercise alone. Supplementing with both creatine and protein in conjunction with exercise provides greater increases in strength and fat-free mass vs. creatine supplementation alone. Creatine appears to be a safe method of increasing strength and fat-free mass in elderly populations. The time frame in which creatine supplements are administered can impact the increases in muscle mass, strength, and performance of older patients. Research evidence of oral creatine supplementation supports an increase in efficacy with many different athletic activities. Currently, more studies are being done to research the side effects of creatine supplementation with long term use. A critical review of the current data concerning the safety of oral creatine supplementation illustrated many concerns of long term use. "In healthy subjects, studies of adverse effects have focused on muscle cramping, gastrointestinal symptoms, and renal/hypatic laboratory results." Some other less researched effects that have been found were water retention and increased work load on the kidneys. The formation of formaldehyde is commonly cited as a safety hazard associated with creatine. However, creatine supplementation does not significantly increase formaldehyde production before or after a supplementation regimen. Creatine supplementation has been shown to improve body composition, anaerobic performance, muscular strength, and muscular power, and muscular endurance. Creatine may help to increase recovery following exercise. The benefits of creatine supplementation are effective for both young and older adults. Creatine may have less effect on women than men;however, both men and women can benefit from creatine use. Creatine should be supplemented for a least 28-30 days to see improvements with longer lengths of supplementation (> 12 week) for more significant results. Creatine loading phases lasting 5-9 days have shown inconsistent improvements in physical performance. In the rehabilitation setting, creatine may work as a recovery agent and shorten recovery time from injury. Creatine has shown to be effective for patients with COPD, Parkinson’s disease, and muscular dystrophies. Side effects of creatine can include muscle cramping, gastrointestinal symptoms, water retention, and possible renal/hepatic changes. ↑ 1.0 1.1 1.2 Bemben MG, Lamont HS. Creatine supplementation and exercise performance: recent findings. Sports medicine (Auckland, NZ). 2005;35(2):107-25. ↑ 2.0 2.1 Candow DG, Forbes SC, Little JP, Cornish SM, Pinkoski C, Chilibeck PD. Effect of nutritional interventions and resistance exercise on aging muscle mass and strength. Biogerontology. 2012;13(4):345-58. ↑ 3.0 3.1 3.2 3.3 Rawson ES, Venezia AC. Use of creatine in the elderly and evidence for effects on cognitive function in young and old. Amino acids. 2011;40(5):1349-1362. ↑ 4.0 4.1 4.2 4.3 4.4 Camic, C, Housh, T, Zuniga, J, Traylor, D, Bergstrom, H, Schmidt, R. . . . Housh, D. The effects of polyethylene glycosylated creatine supplementation on anaerobic performance measures and body composition. Journal of Strength and Conditioning Research 2014; 28: 825-833. ↑ Sanchez-Gonzalez MA, Wieder R, Kim JS, Vicil F, Figueroa A. Creatine supplementation attenuates hemodynamic and arterial stiffness responses following an acute bout of isokinetic exercise. Eur J Appl Physiol. 2011 Sep;111(9):1965-71. PubMed PMID: 21249385. Epub 2011/01/21. eng. ↑ 10.0 10.1 10.2 Herda TJ, Beck TW, Ryan ED, Smith AE, Walter AA, Hartman MJ, et al. Effects of creatine monohydrate and polyethylene glycosylated creatine supplementation on muscular strength, endurance, and power output. The Journal of Strength & Conditioning Research. 2009;23(3):818-26. ↑ 14.0 14.1 Eijnde B, Urso B, Richter EA, Greenhaff PL, Hespel P. Effect of oral creatine supplementation on human muscle GLUT4 protein content after immobilization. Diabetes. 2001;50(1):18-23. ↑ 16.0 16.1 Fuld JP, Kilduff LP, Neder JA, Pitsiladis Y, Lean MEJ, Ward SA, Cotton MM. Creatine supplementation during pulmonary rehabilitation in chronic obstructive pulmonary disease. Thorax 2005;60:531-37. ↑ 18.0 18.1 Kley R, Tarnopolsky M, Vorgerd M. Creatine for treating muscle disorder. Cochrane Database of Systematic Reviews. 2013;6. ↑ 19.0 19.1 19.2 19.3 Brose A, Parise G, Tarnopolsky MA. Creatine supplementation enhances isometric strength and body composition improvements following strength exercise training in older adults. Journal of Gerontology: Biological Sciences 2003;58;11-19. ↑ 21.0 21.1 21.2 Candow DG, Vogt E, Johannsmeyer S, Forbes SC, Farthing JP. Strategic creatine supplementation and resistance training in healthy older adults. Applied Physiology, Nutrition, and Metabolism. 2015;40(999):1-6. ↑ 22.0 22.1 22.2 Juhn MS, Tarnopolsky M. Potential side effects of oral creatine supplementation: a critical review. Clinical Journal of Sport Medicine 1998;8:298-304. Full version: http://ovidsp.tx.ovid.com.webproxy.ouhsc.edu (accessed 19 Nov 2015). ↑ Cramer JT, Stout JR, Culbertson JY, Egan AD. Effects of creatine supplementation and three days of resistance training on muscle strength, power output, and neuromuscular function. The Journal of Strength & Conditioning Research. 2007;21(3):668-77.